Writing this whilst looking back over 2017 I find it hard to comprehend that a group of volunteers made all this happen. However, the WEDF team of volunteers is simply an incredible team. They are great communicators, honest about what they are capable of, and incredibly generous with their time and talent. And as I review 2017 and think, ​‘are we really going to top that?’, I get a glimpse of plans for 2018’s programme, and yep, I wouldn’t be surprised if we do! We started off January 2017 with a talk of two halves, equal in personal passion. Jim Sutherland and Craig Oldham paired up to tell stories about a miscellany of print, publishing and projects. Both designers are prolific creators of self-initiated projects and it was a wonderful insight into the processes and inspirations behind some of these projects. January also saw the last two sessions from our fourth series of Espresso Sessions, designed to provide short smart shots of *enter subject matter here*. These sessions run for an hour and a half first thing in the morning, and are affordable, informative and inspirational kick-starts to your day. David Sloly took to the high seas of Welsh Back and led a session called ​‘Storytelling Systems’, helping us all communicate with greater clarity and memorability. And Hannah Bartholomew, Account Director at Taxi Studio, opened their doors to talk about what takes you ​‘From Good to Great Client Agency Partnerships’. 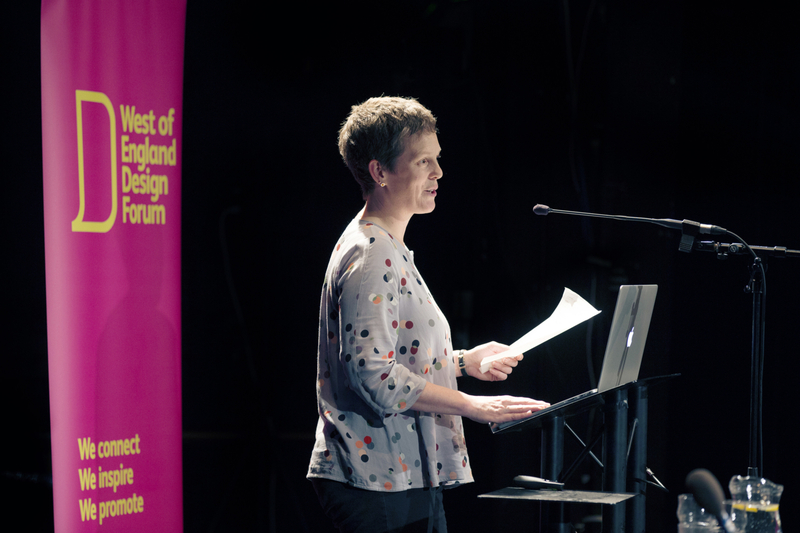 April saw us bring together all the acronyms in fabulous typefaces when WEDF + ISTD presented Erik Spiekermann. Jonathan Doney, the chair of the International Society of Typographic Designers, introduced us to the work that they do around the globe, diagnosed us all with mild to extreme typomania. It was then Erik’s turn to take to the floor and humorously waltz us through the highlights of his career and the letterpress studio he has developed (think typographic science lab): many studio walls are now adorned with his bespokely printed WEDF posters. Danke schön. The month of May saw us present Kerning The Gap to the West of England. Kerning The Gap is a network for equality in the industry, and Nat Maher, the force behind KTG, spoke about the reasons behind setting it up, what it is and what it isn’t, and why we need networks like this everywhere. We listened, we heard and we’re doing it. 2018 will see the launch of an initiative tailored to the West of England. June was bonkers. I’ve never experienced a month that was so full of WEDF events that it was difficult to find time to go to work! We were lucky enough to be supporting an initiative set up by six curiously creative design influencers: Werkhouse was born from the idea of helping students and graduates understand more fully the changing needs of the commercial design industry. A weekend event with almost a ratio of one-to-one participants and leaders proved to be the most wonderful mutual learning event. New relationships formed between all parties and plans to run a similar weekend this year are fully underway. Stefan Sagmeister popped over to Bristol to show us The Happy Film and do a Q&A on the subject, which made us all very happy. I never thought I would be sat outside The Small Bar on King Street, on a warm summer’s evening surrounded by a lovely group of creative people that included Mr Sagmeister! Michael Johnson gave us a double whammy! A wonderfully candid and human-centred talk (punctuated by a text from his wife) on a Wednesday evening, he condensed the wisdom gathered over many years and pages of his book Branding in Five and a Half Steps, along with extra anecdotes regarding the sharing of the Mozilla rebrand and the crowd-sourced ​‘help’ he received from some of his followers. The following day Michael also delivered a D&AD training session, ​‘Branding Demystified’, at Home’s fabulous new studio. A session designed to clarify branding and give those who attended a much clearer understanding of what it means and what it does. This was a much sought-after course on the D&AD training schedule, made even more accessible to the West of England by our hosting it in Bristol. September saw us start a new ​‘term’ with a couple of working sessions. The enthusiasm at the launch of the (working title) Women in Design initiative back in June was replicated in the workshop session that we ran to explore what was really needed from this initiative, with four groups looking at training, events, case studies and what shape a (wo)manifesto would and should take. September also saw the launch of PALS (Peer Assisted Learning sessions) with its first talk on freelancing. The PALS model ensures we provide training and development opportunities for all budgets and has been developed with minimum spend and with maximum knowledge share in mind. The first session took the topic of freelancing apart, with three freelancers on hand to talk frankly about their experiences, answering questions and offering tips, suggestions and recommendations of support. It was a great success and more from PALS is to come in 2018. We launched a new initiative at our October talk, giving the stage over to an up-and-coming talent in the West of England with our WEDF Warm-Up Act – John Mawby. John is a letter cutter, designing and drawing his elegant designs by hand, without the need for typefaces and computers, and then ​‘simply’ (his words) cutting these designs from the slate or wood. He left us in awe of his natural talent and affinity with his materials, and it was a humbly-delivered talk that inspired us all. Jack Renwick then gave us a heartfelt talk about her career, from her realisation that graphic design was ​‘a thing’ to her mantra today of ​‘Blood, Sweat and Tea’ – along with a distinct passion for red and white strips. And our Design Buddy scheme was launched for its seventh year! Sixteen second year UWE students have been paired with design industry ​‘buddies’ for 12 months of industry mentoring, with many buddies offering much more time and industry insight than the minimum ​‘4 x 1 hour’ mentoring sessions. Our most recent success story from this scheme resulted in Taxi Studio recruiting talented Junior Creative, Lily Papadopoulos – read all about her experience of Design Buddy here. Never ones to want to go out with a whimper, we rapped-up (stet) the year with Sound Design, presented by WEDF and hosted by the ever-energetic, design dynamo that is Gavin Strange. 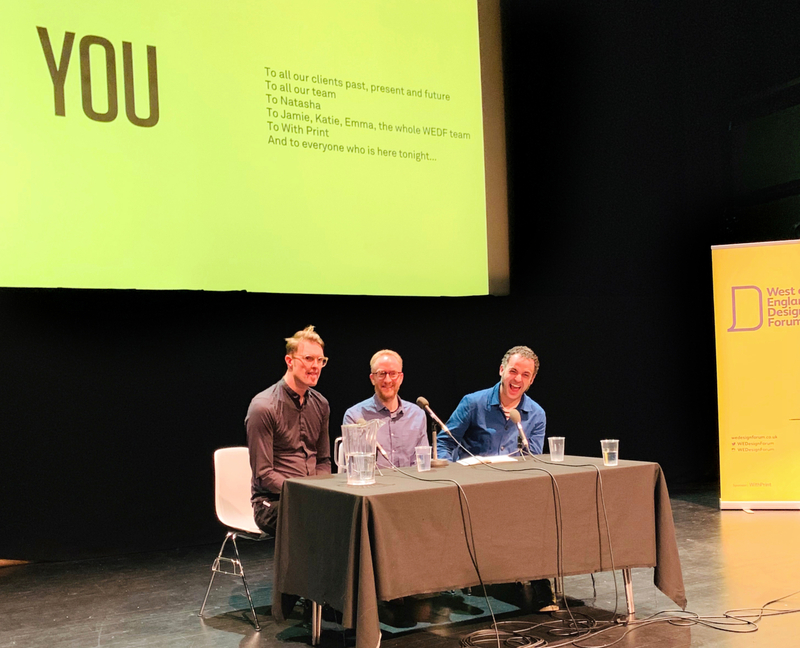 Sound Design was an evening of music and design musings in which we heard from Rebecca Cleal, music photographer and printmaker; Adam Rodgers, Creative Director at International Magic; Jimmy Turrell, graphic artist and video director; and Chris Hopewell, film-maker from Jacknife Prints. We were regaled with stories of unbelievable and life-changing phone calls, all-night-all-week-sleep-in-the-studio regimes to meet impossible deadlines for dream clients, and many other entertaining stories, all whilst working for the likes of Radiohead, Beck, FKA Twiggs, Savage and Dismaland – to name but a few! Thank you to everyone, every agency, every speaker and especially every volunteer that made 2017 an incredible year – onwards to 2018!